Date Night is for Everyone! We try to make it fun and a little easier to cultivate your human romantic connections. This event and Interactive Games will be led by the show host who will announce, instruct, and conduct each activity. After all the fun and games, there will be an R&B, Comedy, and Poetry show. Valentine's Day is right around the corner. If you have a special someone, bring 'em! If not, come get 'em! Booth Seating Reservation: Reservation for Booth seating, Access to All Group Activities and Games, and Show Admission. Your table will be marked reserved, but this booth will be open to other Reserved Seating ticket holders at your table. This is a great way to meet new people. VIP Reservation: Reservation for VIP booth seating, Complementary appetizers and a meal, Bottle Service, Access to All Group Activities and Games, and Show Admission. Additional charge for top premium bottle choices. Your table will be marked reserved, but this booth and bottle service will be open to other VIP ticket holders at your table. This is a great way to meet new people. VIP Booth Premium Reservation: Reservation for one VIP booth and table that comfortably seats 5, Complementary appetizers, 5 complementary meals, Bottle Service for your table, Access to All Group Activities and Games, and Show Admission. Bottle service includes Premium choices. Early Bird General Admission: Access to Games and Show Admission at a discounted rate. 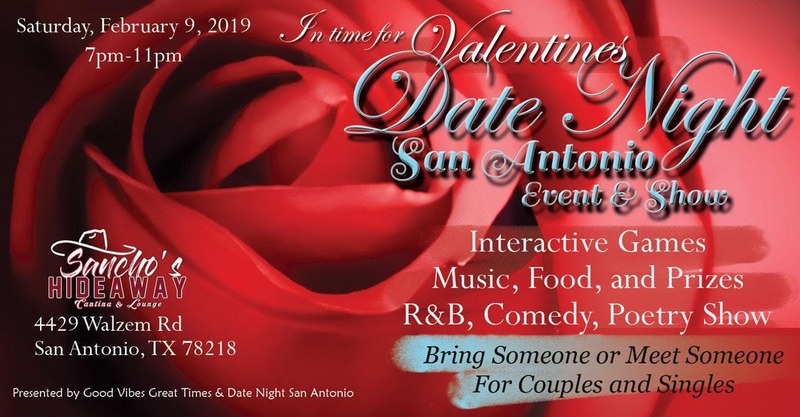 SPEED DATING will be hosted separately during this event. Click Here for more information. Our venue has plenty of parking and a full menu of food and drink options. Come enjoy a night of Laughter, Drinks, Music, and FUN!